Lakeen is the 1039th highest place in Ireland. As close to a wind turbine as you'll get. Picture from wicklore : View of Lakeen with its six turbines from Seskin to the west. Picture: View of Lakeen with its six turbines from Seskin to the west. 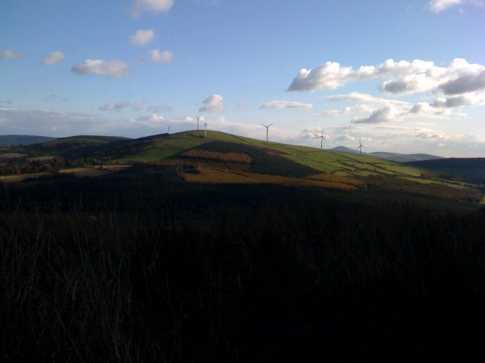 The presence of these wind turbines on our hills is an interesting juxtaposition. They take from the local natural environment, while simultaneously symbolising the effort to be green and develop clean power sources. Personally I like them, although I understand they have caused lots of damage in Mayo and elsewhere. Picture from csd : Telecoms hut and base of one of the turbines at Lakeen, Muskeagh in the background. Picture: Telecoms hut and base of one of the turbines at Lakeen, Muskeagh in the background. The gate at the entrance to the track up to the summit of Lakeen is festooned with a number of stern warnings to keep away, so it was with some trepidation that I set off from the same parking spot as wicklore did. The six wind turbines on the main summit are to be joined by two more being constructed on the neighbouring hill to the SE, and a telecoms hut has been added to the summit of Lackeen. Quite the industrial complex!